mySociety’s EveryPolitician project aims to make data available on every politician in the world. It’s going well: we’re already sharing data on the politicians from nearly every country on the planet. That’s over 68,652 people and 2.9 million individual pieces of data, numbers which will be out of date almost as soon as you’ve read them. Naturally, the width and depth of that data varies from country to country, depending on the sources available — but that’s a topic for another blog post. 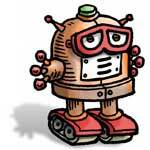 Today the EveryPolitician team would like to introduce you to its busiest member, who is blogging at EveryPolitician bot. A bot is an automated agent — a robot, no less, albeit one crafted entirely in software. First, some background on why we need our little bot. Legislatures change en masse, because of elections, etc. We try to know when countries’ governments are due to change because that’s the kind of thing we’re interested in anyway (remember mySociety helps run websites for parliamentary monitoring organisations, such as Mzalendo in Kenya). But even anticipated changes are rarely straightforward, not least because there’s always a lag between a legislature changing and the data about its new members becoming available, especially from official national sources. Not all sweeping changes are planned. There are coups and revolutions and other unscheduled or premature ends-of-term. Or die, or change their names or titles, or switch party or faction. Or the existing ones change their names, or form coalitions. There are good reasons (better representation) and bad reasons (gerrymandering) why the areas in constituency-based systems often change. By way of a timely example, our UK readers probably know that the wards have changed for the forthcoming elections, and that mySociety built a handy tool that tells you what ward you’re in. Played Gender Balance recently? Behind that is a dataset that keeps being updated (whenever there are new politicians) but which is itself a source of constantly-updating data for us. Our data comes from an ever-increasing number of sources, commonly more than one for any given legislature (the politicians’ twitter handles are often found in a different online place from their dates of birth, for example). We always welcome more contributions — if you think you’ve got new sources for the country you live in, please let us know. We collect historic data too — not just the politicians in the current term. For some countries we’ve already got data going back decades. Sources for data like this can sometimes be hard to find; slowly but surely new ones keeping turning up. So, with all this sort of thing going on, it’s too much to expect a small team of humans to manage it all. Which is where our bot comes in. To be honest with you, the bot doesn’t really look like this because, being software, it’s entirely non-corporeal. Sorry. We’ve automated many of our processes: scraping, collecting, checking changes, submitting them for inclusion — so the humans can concentrate on what they do best (which is understanding things, and making informed decisions). In technical terms, our bot handles most things in an event-driven way. It springs into action when triggered by a notification. Often that will be a webhook (for example, a scraper finishes getting data so it issues a webhook to let the bot know), although the bot also follows a schedule of regular tasks too. Computers are great for running repetitive tasks and making quantitative comparisons, and a lot of the work that needs to be done with our ever-changing data fits such a description. The interconnectedness of all the different tasks the bot performs is complex. We originally thought we’d document that in one go — there’s a beautiful diagram waiting to be drawn, that’s for sure — but it soon became clear this was going to be a big job. Too big. Not only is the bot’s total activity complicated because there are a lot of interdependencies, but it’s always changing: the developers are frequently adding to the variety of tasks the bot is doing for us. So in the end we realised we should just let the bot speak for itself, and describe task-by-task some of the things it does. Broken down like this it’s easier to follow. We know not everybody will be interested, which is fine: the EveryPolitician data is useful for all sorts of people — journalists, researchers, parliamentary monitors, activists, parliamentarians themselves, and many more — and if you’re such a person you don’t need to know about how we’re making it happen. But if you’re technically-minded — and especially if you’re a developer who uses GitHub but hasn’t yet used the GitHub API as thoroughly as we’ve needed to, or are looking for ways to manage always-shifting data sets like ours — then we hope you’ll find what the bot says both informative and useful. The bot is already a few days into blogging — its first post was “I am a busy bot”, but you can see all the others on its own Medium page. You can also follow it on Twitter as @everypolitician. Of course, its true home, where all the real work is done, is the everypoliticianbot account on GitHub. Images: CC-BY-SA from the EveryPolitician bot’s very own scrapbook.